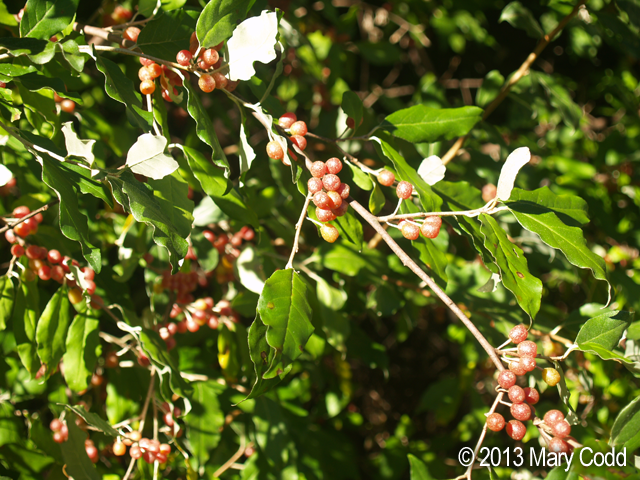 This large deciduous shrub grows quite tall, perhaps 15 or 16 feet. 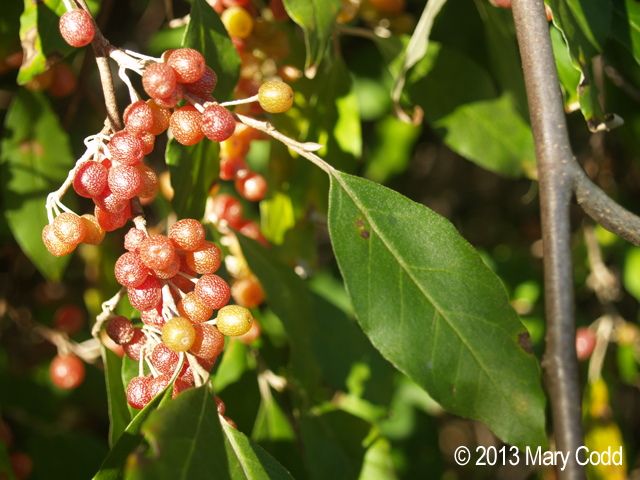 It bears a tremendous amount of fruit, beautiful red berries about a quarter inch in size, covered with tiny silver dots. 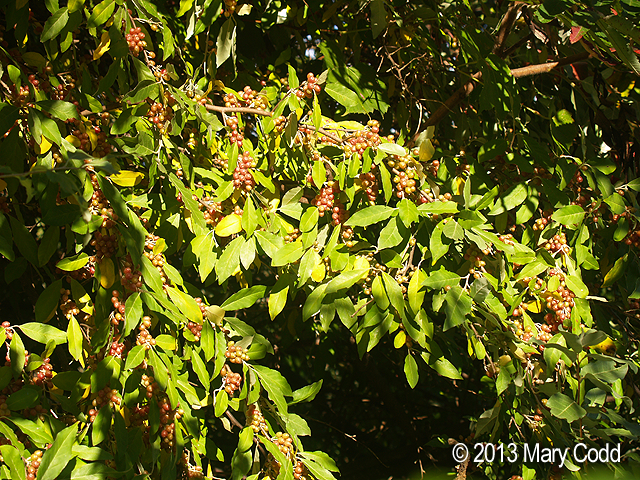 The berries are in large clusters that weigh down the branches. The leaves, which are borne alternately, are 2 to 3 inches long, oval-shaped coming to a point at the ends, dull dark green on top and silvery underneath with slightly wavy edges. Siverberry or Autumnberry are much better names for this plant because the ripe berries taste slightly tart, and not at all like olives. 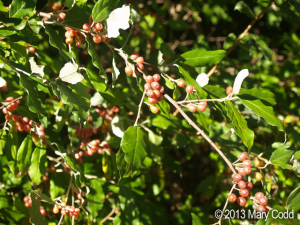 Elaeagnus umbellata is not native to New England or North America, and is now considered an invasive species, having been introduced from Asia in 1830 where it is used for food. Forty or fifty years ago these shrubs were planted by government agencies in North America primarily for erosion control, soil improvement, wildlife food and cover, and landscaping. 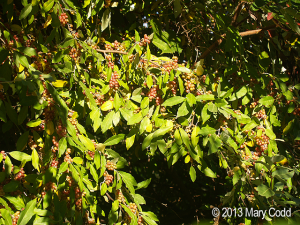 It is drought tolerant and the berries are enjoyed by birds and mammals so the seeds are spread widely and it has crowded out many species of native shrubs. I found an Autumnberry well established in a lilac bush in my yard. I’ll have my work cut out for me trying to eradicate it so that it doesn’t choke out the lilac. The good news is that the berries are very tasty, easy to pick, and good for you, too! They are high in vitamins A, C, and E, and contain about 17 times more of the anti-oxidant carotinoid lycopene than tomatoes. 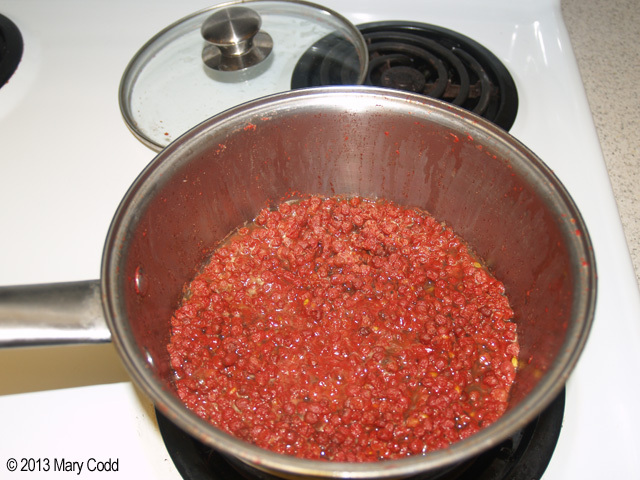 You can eat the ripe berries raw or cook and puree them to use in yogurt, jam, pie filling, cake, ice cream, sherbet, or dried as fruit leather. I’ve also read that you can use them to make a light fruit wine. I cleaned all the berries that I picked (about 3 quarts) cooked them in 4 cup batches, and pureed them in a food mill to remove the seeds. 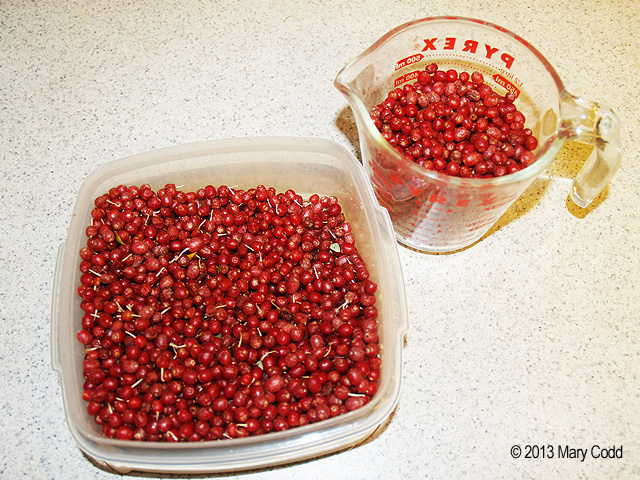 Removing the seeds was the hardest part because they are quite large relative to the size of the berries. 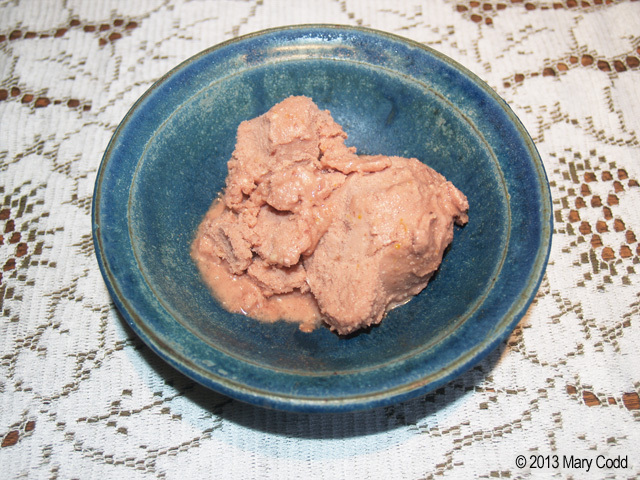 I froze two of the three batches and used one to make a vegan Autumnberry Sherbet with almond milk in my ice cream maker. It was very good!